A 23-year-old boy presented with a complaint of missing teeth with difficulty in speaking and eating to Farooqia Dental College and Hospital. He was moderately built, poorly nourished and had the typical face of EDA with features like: Frontal bossing, prominent supraorbital ridges, perioral pigmentation, dry skin, depressed nasal bridge, protuberant lips, low-set ears, recession of hair line all along with fine, sparse scanty scalp hair, scanty eyebrow and eye lashes. The left eye was slightly smaller than the right eye and the nails were not very brittle [Figure 1], [Figure 2], [Figure 3] and [Figure 4]. Informed consent was procured from patients before any findings were reported. He was accompanied by his mother who gave a history of a total of six children born of a non-consanguineous marriage, with the boy and his younger male identical twin also suffering from the same condition since birth [Figure 1]. No other members of the family suffered from this trait. The mother also gave a history of the twins, presenting with partial anodontia in the upper jaw, complete anodontia of the lower jaw, progressive hyper pigmentation around eyes and mouth, complete absence of sweating since birth, repeated episodes of unexplained hyperpyrexia and thirst, which necessitated consistent drinking of cold water. They were of normal intelligence. Medical history revealed that the boy complained of frequent headache, dry eyes and poor vision in the left eye. Other systems were within normal limits. Intraoral examination revealed partial anodontia of the maxillary arch with the presence of four teeth suggestive of maxillary central incisors and canines on either side of the midline. 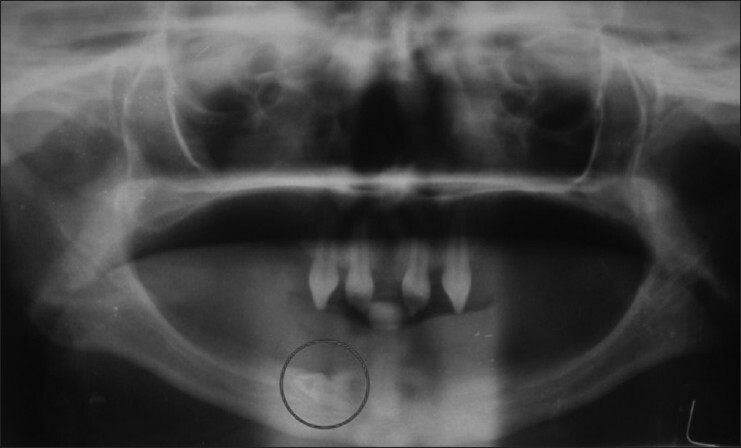 The mandibular arch was completely edentulous with poorly developed alveolus. Moderate dryness of the mouth, with inflamed mucosa was evident [Figure 5]. A panoramic radiograph showed the presence of four cone-shaped crowns with roots in the maxilla consistent with central incisors and canines on either side of the midline. The mandibular alveolar ridge was narrow with complete anodontia and with evidence of right impacted canine like tooth [Figure 6]. 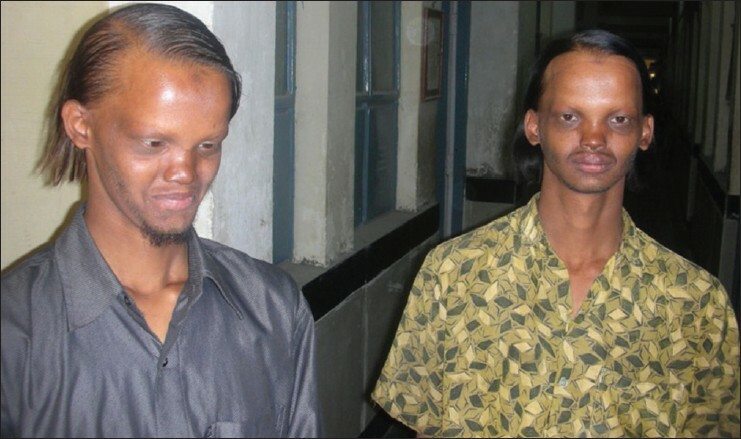 The younger twin brother also presented with almost the same identical physical and medical findings. 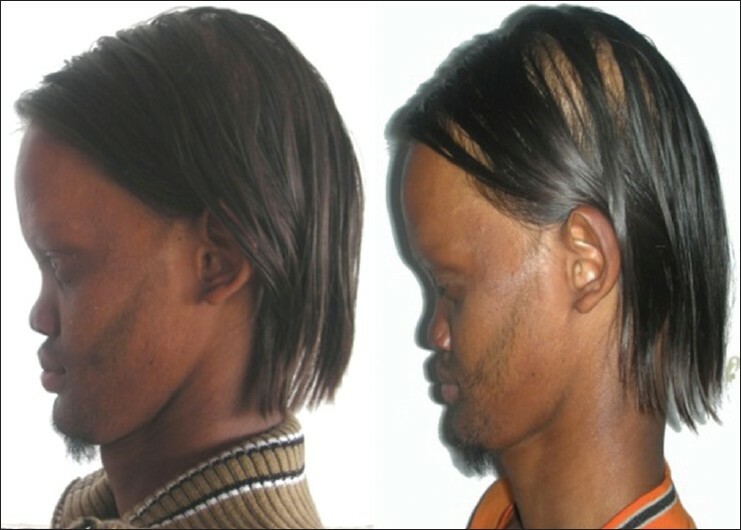 He demonstrated good vision with no marked asymmetry of the eyes and a slight increase in scalp hair. Intraoral examination was identical. Examination of the panoramic radiographs of the younger twin showed the presence of four cone-shaped crowns with roots in maxilla consistent with central incisors and canines on either side of the midline. The mandibular teeth were missing with a narrow alveolar ridge. Cephalogram revealed normal growth pattern in both the twins [Figure 7]. Examination of impression and working model [Figure 8] confirmed it. Since hypohidrosis, hypotrichosis and hypodontia were very evident on physical examination, the twins were diagnosed with hereditary hypohidrotic ectodermal dysplasia (HED) with partial anodontia. Treatment plan consisted of fixed partial dentures (FPD) for the conical shaped maxillary anterior teeth followed by construction of removable dentures. Thurnam, first reported EDA and the term EDA was coined in 1929 by Weech. EDAs is congenital, diffuse and non-progressive. To date, more than 192 distinct disorders have been described with the most common being X-linked recessive HED ( Christ-Siemens-Touraine syndrome More Details) and hidrotic EDA (Clouston syndrome). Current classification of EDAs is based on clinical features. 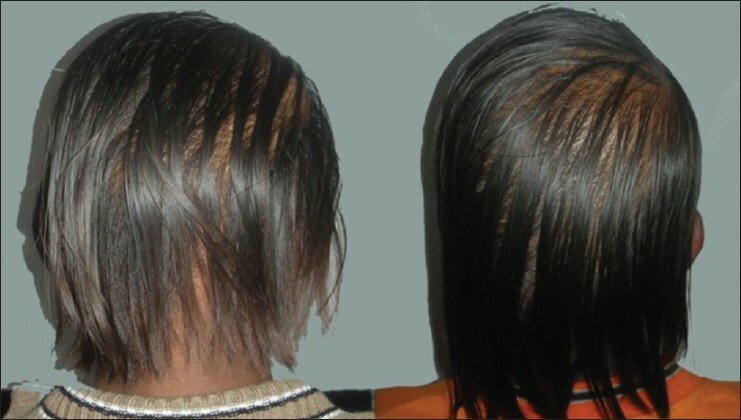 Pure EDAs are manifested by defects in ectodermal structures alone while EDA syndromes are defined by the combination of ectodermal defects in association with other anomalies. Freire-Maia and Pinheiro proposed the first classification system of the EDAs in 1982, with additional updates in 1994 and 2001. Their original classification system stratified the EDAs into different subgroups according to the presence or absence of (1) hair anomalies or trichodysplasias, (2) dental abnormalities, (3) nail abnormalities or onychodysplasias, and (4) eccrine gland dysfunction or dyshidrosis. Overall, the EDAs were classified into either Group A disorders, which were manifested by defects in at least two of the four classic ectodermal structures as defined above, with or without other defects and Group B disorders, which were manifested by a defect in one classic ectodermal structure (1-4 from above) in combination with (5) a defect in one other ectodermal structure (i.e., ears, lips, dermatoglyphics). Eleven Groups A subgroups were defined, each with a distinct combination of two or more ectodermal defects (e.g., 2-4, 1-2-3, 1-2-3-4 from above). The Group B disorders were indicated as 1-5, 2-5, 3-5, or 4-5 (from above). With the recent identification of the causative genetic defect for a number of the EDAs, newer classification systems have been devised. In 2003, Lamartine reclassified the EDAs into the following functional groups based on the underlying pathophysiologic defect: (1) Cell-to-cell communication and signaling, (2) adhesion, (3) development and (4) other. Similarly, in 2001, Priolo and Laganà reclassified the EDAs into two main functional groups: (1) Defects in developmental regulation/epithelial-mesenchymal interaction and (2) defects in cytoskeleton maintenance and cell stability. Several EDA syndromes may manifest in association with midfacial defects, mainly cleft lip, cleft palate or both. The three most commonly recognized entities are (1) EDA, ectrodactyly, and clefting syndrome (2) Hay-Wells syndrome or ankyloblepharon, EDA, and cleft lip/palate syndrome and (3) Rapp-Hodgkin syndrome, all of which are caused by mutations in the TP63 gene. 1. El-Tony MK, Feteih RM, Farsi JM. Hereditary hypohidrotic Ectodermal Dysplasia with anodontia: A case report. Saudi Den J 1994;6:31-4. 2. Vanessa N. Ectodermal Dysplasia, Derm Net NZ. 1-4, Available from: http://www.dermnetnz.org/hair-nails-sweat/ectodermal-dysplasia.html. [Cited on 2013 Jun 13]. 3. Shah KN. Ectodermal Dysplasia. eMedicine Dermatology overview 2009. (emedicine.medscape.com/article/1110595). 4. Mortier K, Wackens G, Ectodermal dysplasia anhidrotic. 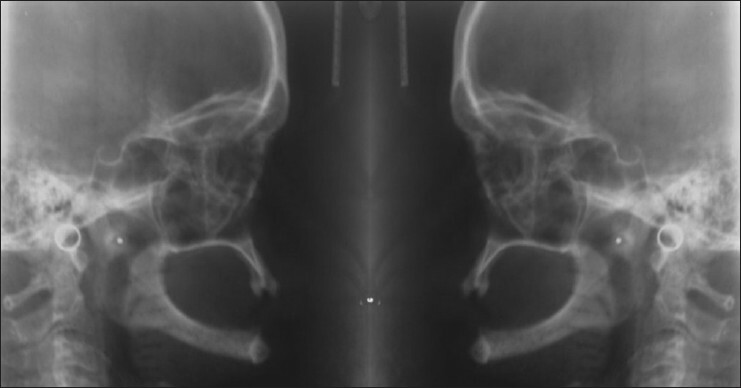 Cleft Palate Craniofac J 2001;38:504-18. 5. Ramraje SN, Wasnik M, Momin YA. Anhidrotic ectodermal dysplasia: A report of two cases. Bombay Hosp J 2009;51:289-90. 6. Pirgon O, Atabek ME, Tanju IA. Congenital anodontia in ectodermal dysplasia. J Pediatr Endocrinol Metab 2008;21:1111-2. 7. Clauss F, Manière MC, Obry F, Waltmann E, Hadj-Rabia S, Bodemer C, et al. Dento-craniofacial phenotypes and underlying molecular mechanisms in hypohidrotic ectodermal dysplasia (HED): A review. J Dent Res 2008;87:1089-99. 8. Lu PD, Schaffer JV. Hypohidrotic ectodermal dysplasia. Dermatol Online J 2008;14:22. 9. Azeem Z, Naqvi SK, Ansar M, Wali A, Naveed AK, Ali G, et al. Recurrent mutations in functionally-related EDA and EDAR genes underlie X-linked isolated hypodontia and autosomal recessive hypohidrotic ectodermal dysplasia. Arch Dermatol Res 2009;301:625-9. 10. Kaul S, Reddy R. Prosthetic rehabilitation of an adolescent with hypohidrotic ectodermal dysplasia with partial anodontia: Case report. J Indian Soc Pedod Prev Dent 2008;26:177-81.